California’s challenge for new residential homes to be net zero by 2020 continues a long march of ever-stricter regulations strategically positioned to push industry practices in a particular direction. The lowest hanging fruit has been picked with the solar 70s and the explosion of photovoltaic (PV) installations that followed and the renewable energy generation is hovering at about 20 percent. While there is more opportunity there and this work is important, the graph of returns on investment (ROI) are leveling to incremental increases. We can best help this effort in fulfilling its potential by focusing on the next greatest challenge – reducing energy demand. Buildings currently account for about 40 percent of US energy consumption and, within these buildings, nearly 30 percent of the energy used is to regulate heat. Homes designed with passive heating in mind can substantially reduce greenhouse gas emissions for the life of the structure through elegant, time-tested solutions while also reducing pressure on our energy grid and generation systems. If you were an ancient seafarer you would want your vessel to be waterproof, to circulate fresh air, and to hold and heat the potable water your occupants need for the life of their journey. Why should a modern land vessel be any different? In talking with Shellie Collier, who has designed well over a hundred LEED residences, I believe we can learn much from the past and bring these tested solutions into 2019, refreshed and improved, using modern technology and systems thinking. Buildings, unlike boats, generally stay in one location. Applying architectural designs for one environment in another usually result in a variety of challenges. The building should fit the environment. Use local temperature ranges and precipitation trends to create a smart building exterior. Some structures will need to absorb or reflect radiant heat, to capture or reflect sunlight, and require specific types of insulation. With a tight envelope, the HVAC system can be properly sized and is likely much smaller than what has been used in conventional buildings. Plan for air circulation to moderate ambient temperature. A continuous, slow moving fan in the bath or laundry area creates air infiltration through negative pressure, saving additional heating and cooling requirements. Calculate water use for the intended occupancy and anticipated uses. Native and drought-tolerant landscaping choices can reduce water usage by 20 percent or more while bolstering the local ecosystem biodiversity. Bathroom fixtures are now only using one gallon of water/flush and sinks are using 1.2 gallons of water/minute, reducing the amount of water homes need operationally. Designs that include water catchment systems, treatment for water reuse, and groundwater infiltration techniques, provide opportunity to further conserve and contain potable water that matches or exceeds average use. Domestic hot water equipment is reaching 92-98 percent energy efficiency. This, along with a plan for maximum solar thermal, can reduce reliance on solar PV while still meeting occupancy energy demands. However, what I hear people tell me is that Los Angeles has a housing shortage, and these solutions are only for those who can afford them. This cannot be further from the truth. In looking at solar thermal alone, current systems are boasting 35-40 percent energy cost savings over conventional systems, with payback approaching 3-5 years and dropping. Truly affordable housing includes those spaces that occupants can not only afford to build, but to occupy, operate, and maintain. To put someone into a home they cannot maintain is the cruelest of acts. This should be the beginning of opportunity, not an anchor. Affordable housing incentives should therefore reflect the best of what we know about green building technologies as the intended occupants have even less disposable income to pay for energy and water than the average home buyer. What lies ahead for 2019 is exciting in its simplicity and elegance, although visually subtle. We are building a system of self-reliant, resilient homes that conserve through design and application of strategic technology. Sailing vessels have been net zero for centuries, but now that knowledge is coming into port for a new cross-cultural exchange. Stacy Sinclair is an environmental scientist and author. 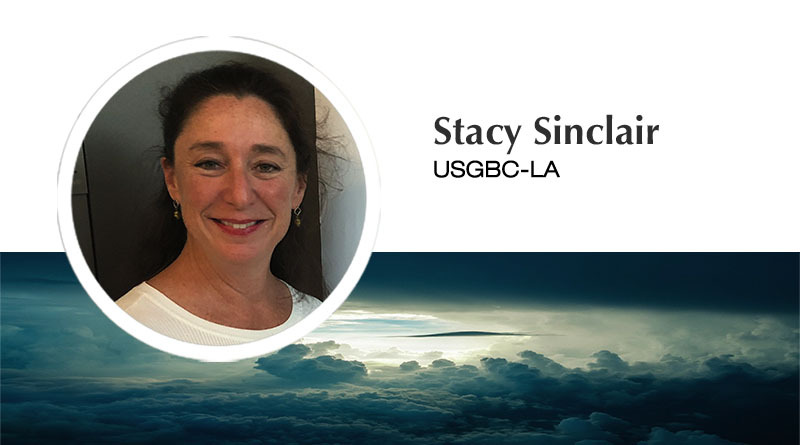 As a member of USGBC-LA, Stacy created and facilitates the USGC-LA blog, Snapshots on Sustainability, and explores perspectives that drive decision-making on issues related to sustainability and resilience.